This happens occasionally. The thermostat reaches the desired temperature, the indoor unit shuts off, the air stops blowing, but the outdoor unit keeps on running. In the heating mode (if it's a heat pump) it could eventually shut off on a high pressure safety device. But in the cooling mode, it could run forever unless you turn the breaker off. And this will cause the indoor coil to freeze up into a solid block of ice, eventually the ice will build-up and travel all the way to the outdoor unit. So what causes this? Only a few things, the most common of which is a stuck compressor contactor - located in the outdoor unit. The contacts tend to get pitted-up. Eventually they can weld shut. This can cause serious damage to the system. 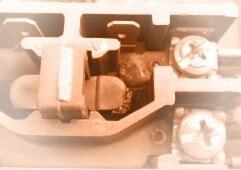 It is good practice to replace the contactor every few years or when pitted - just like spark plugs in a car. Another cause would be a shorted thermostat cable. This can be caused by a weed-whacker hitting the wire outside, or a wire-staple digging into the wire too tightly, rodents chewing on it, or just bad wire. Lastly, the thermostat itself could be bad, sending a signal to the outdoor unit when it isn't supposed to.